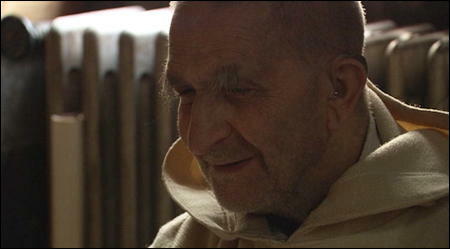 Near the end of the film Into Great Silence (technically it is a film, but it is something more), there is an interview with an old, blind monk. The years of solitude do not wear heavy on him. He is truly happy, and peace envelopes him, coming to you even through the camera lens. His voice is calm and soothing, and joy rings within his words even though I do not understand his French. Below is most of his extended monologue as presented in the accompanying special features DVD with the film. There are long pauses between portions of his talk as if to recognize the presence of God in and among his words. No, why be afraid of death? For those who’ve loved God like a father, you see, death isn’t to be feared. On the contrary, it’s a big reunion, since God, you see, loves us infinitely. He created us through pure love, and when one of us responds to this love, well, it’s big re-finding up there. In other words, one finds Him once more as a father who loves us infinitely and is very merry. Well, one has sins, but all sins are effaced as soon as one loves God like a father. And in practice, the nearer one comes to God, you see, the happier one is. And in practice, that’s the goal of our life, that is. The nearer one gets to God, the happier one is, the faster one goes toward Him, you see. One comes to terms with God. And in practice, one shouldn’t be afraid of God. On the contrary, it’s a great joy for us, finding a father once more. The past and present, they’re human terms. In God there’s no past, there’s solely the present. And… when He sees us, He sees each of our lives straight off. That’s why, as He is an infinitely good being, He always has an eye for our well being. And whatever happens to us… well, there’s no reason for disquiet. And I very often thank God for having rendered me blind. I’m certain that it’s for the good of my soul that He has permitted it. At present, folk in the world are afraid of death and they are afraid of old age too, of many things like that. But it’s life. When one loves God, one has no reason for disquiet. And in practice, our life in Chartreuse, and for Christians in general, you see, and… Well, the thing is to love God with all one’s heart, with all one’s soul, with all one’s forces, and one’s neighbour as oneself. If one applies that, you know, there are many questions which are insoluble now in the world will immediately be solved. If truly one loved one’s neighbour as oneself, all the injustices in the world today would disappear. To me, life is very simple. We have a creator, God, who is infinitely good, infinitely powerful, who demands simply that we love Him, that we just notice what He does for us… And if one loves Him, well, everything goes well for us. That’s why one should always be happy, a Christian should never be sad, since whatever happens to one is will by God, or, at least, is permitted by God and for the good of one’s soul. And after all, it’s essential for us, isn’t it? God who is infinitely good, all-powerful, and who helps us. Well, one has only to do that, then one is happy.